Single Ropes: The single rope system is the most commonly used system in all of climbing. 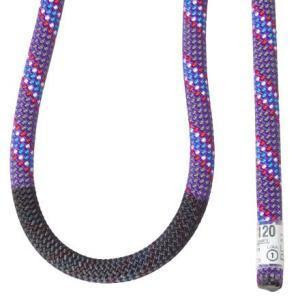 Most climbers will start with a single rope which is adequate for pretty much everything. As a result these are used on ice, rock and in mountaineering settings. Single ropes are the least expensive alternative. Each of the other systems described here require two ropes to be functional. The question has come up in the past as to whether a twin rope should be used on a glacier. The answer is no. There is too much stretch in these ropes for this application and the likelihood of hitting something at the bottom of the crevasse or getting "corked" is too high. The answer to your second question is that it's up to you. I often find it easier to just clip both.